A light and colourful dish that's packed full of nutrition and flavour. Toast the sesame seeds in a dry frying pan set on a medium heat for a few minutes, until they start to change colour slightly and pop. Remove from the heat and leave to cool. Rinse the beansprouts and dry them in a salad spinner. Put in a large bowl with the toasted sesame seeds, all the veg and the sprouted beans and toss together. Whizz all the dressing ingredients in a blender until well combined. 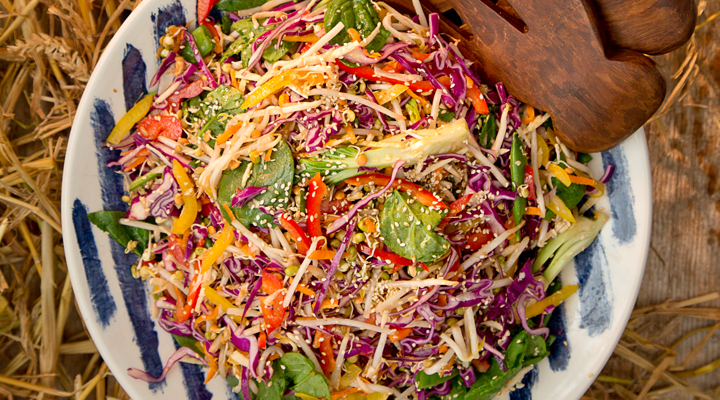 When you’re ready to eat, pour the dressing over the slaw and toss well. Only dress the amount of slaw that you are going to eat at any one time, as once dressed, it won’t keep.